At Helena's office, a mysterious man forces his way inside by coercing Helena's secretary, Carole Martin. The man turns out to be Carole's former husband who has been blackmailing her into giving him money every month, though the exact details of the blackmail are never disclosed. At best, Carole acknowledges that she made a mistake that can legally compromise her, and her husband, Joe, has been exploiting that to his advantage. It is also suggested that the reason Carole is going along with this is because there is a child involved, probably her son. Joe wants access to Helena's legal files in order to dig up more dirt on Carole that he can use to continue extorting money from her. We also learn in these pages that Joe is physically abusive of Carole, which suggests a history of domestic violence. Joe's plan to continue blackmailing Carole is sabotaged with the arrival of Helena Wayne in her Huntress costume, who subsequently 'returns the favour' by beating him down herself. She orders Joe to leave the premises or risk another beating from her. Realising he has no chance against the Huntress (who can legally compromise him), Joe does as he is told, relieving Carole of further threats from him. Seeing an opportunity for a way out, Carole takes advantage of the Huntress' presence to detail the circumstances of Joe's assaults on her, hoping to end them once and for all. In another part of town, Helena's boyfriend, Harry Sims, is seen waiting for the train on his way to work. At the station, Harry picks up that day's paper and notices that his recent endorsement of superheroes following the Thinker's assault made headlines. He also noticed that the paper used a generic bold font instead of the larger font that gets used for major events like the death of a US president. 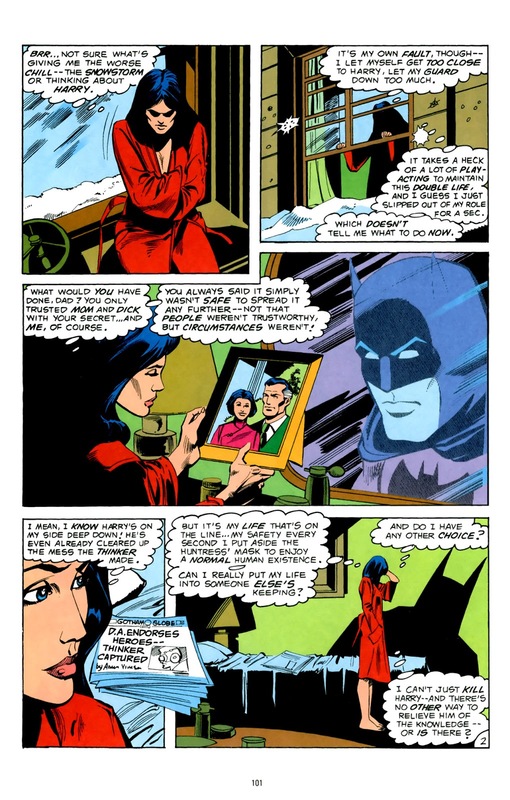 Harry then considers outing Helena Wayne as the Huntress in a press release as a way of advancing his career and acquiring greater recognition by the media, but then scraps the thought when he realises this is his girlfriend's life he is thinking of putting on the line. He then feels terrible for even contemplating the thought of risking someone's life like that for personal gain. Helena is then seen staking the same train station for Joe Martin and pursues him once she finds him. She lets him board the train and later boards herself to avoid tipping him off on her presence. 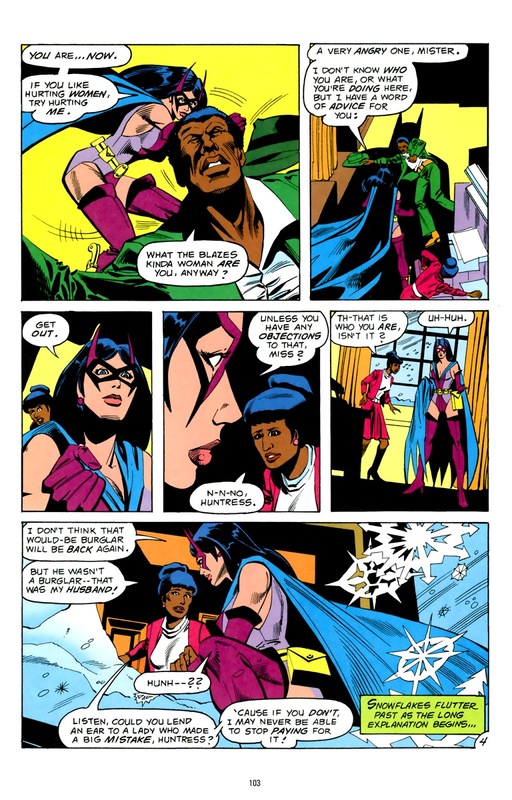 People are seen commenting their fears of the Huntress as she passes by them in her pursuit of Joe, effectively letting the reader know that she does induce fear in people who are guilty of criminal activity. Helena eventually catches up to Joe and beats him unconscious to take him back to her office at Cranston, Grayson, and Wayne. Carole finishes removing traces of herself from Helena's office before Helena herself arrives to work, but the latter arrives in time to prevent her from leaving. Helena (as the Huntress) advices Carole to take her ex-husband down to the DA's office in order to press charges for blackmail using the evidence available. Carole only wanted the Huntress to talk Joe into not exposing her secret, but Helena rationalises that it's better to confront the problem head on and not allow things to continue as is. 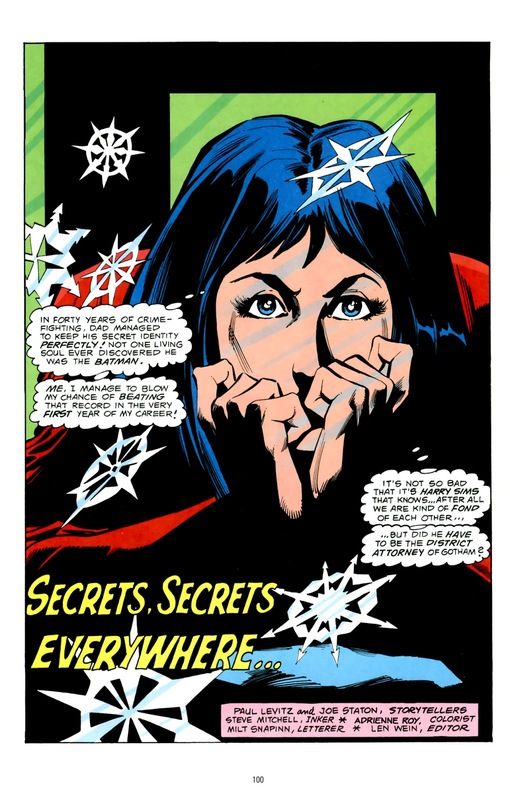 She also reassures Carole that 'Helena Wayne' may be more understanding of her situation than she anticipates if she confides the same information to her like she did the Huntress. Helena departs with her own advice in mind and decides to tackle her problem with Harry herself. Review: This is--in my opinion--one of the best self-contained Huntress stories Paul Levitz wrote in the pre-Crisis era, namely because he takes the time to explore the internal conflicts of the three characters who appear in its pages. He had a lot of interesting developments going for this story that it was very unfortunate it wasn't given a full 20-page comic to properly flesh them out. Carole's story in particular suffered the most from the 8-page limit. The first thing I enjoyed about this story was Helena's characterisation. 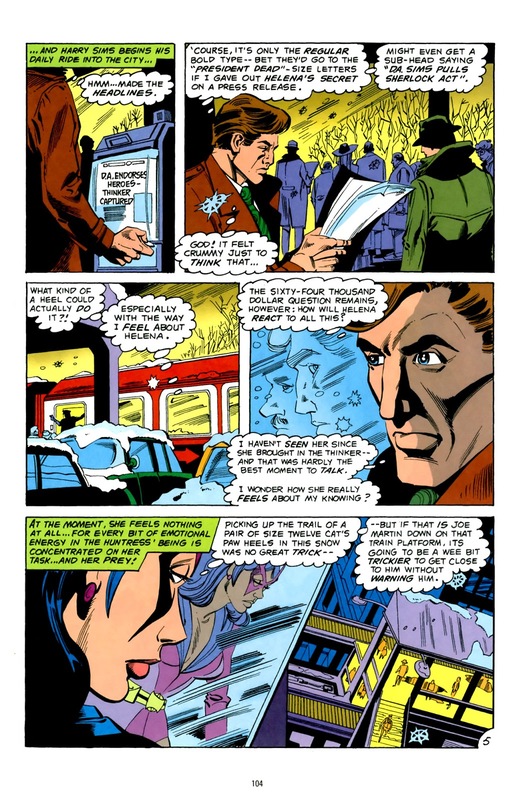 I liked the fact that Levitz wrote the character introspecting on the dangers of having a double life and the fact that it is a lot of work maintaining two separate identities. Considering how often she told her friend Kara (Power Girl) how easy it was to be 'two different people,' it was nice to see Helena realise that maintaining facades isn't as easy as it sounds. In particular, she realised how certain situations can make it easy for her to 'slip out' of her role, especially when she confronts the same people in both of her identities. Where a boyfriend is involved, it's especially easy for her to forget in a split second that she is present as the Huntress and not as Helena Wayne. Another thing Levitz does really well with Helena in these pages is how he gets her to think about the consequences of Harry knowing her secret. On the one hand, she knows that she can trust Harry not to actively disclose her secret to another party, but she also knows that circumstances won't always be in her favour, which is the real danger with Harry knowing her secret. She also hasn't been dating him for very long, which means that--should he break up with her--her secret is still out there waiting to be exposed. The reason her father never had this same problem with her mother was because they've known each other for a very long time, and had built years of trust before he disclosed his secret to her. Her father was also in complete control of how her mother learnt his identity, whereas Helena had no control over how Harry learnt hers. The circumstances therefore left her with a major conundrum to resolve, and one that couldn't be easily resolved without resorting to killing or using an invasive procedure like having Doctor Fate perform a mind wipe on an unwilling participant. It was not only a question of safety for Helena, but also a question of morality where Harry's agency was involved. While I admittedly have never been fond of Harry's character (namely due to his being characterised as sexist and even abusive in Joey Cavalieri's interpretation), Levitz does actually present him in a better light in this story. He is actually presented as a complex individual who feels genuinely shocked to learn his girlfriend leads a double life as both a vigilante and a legal practitioner of law. Those are legitimate concerns when taking into account that Helena can easily use her power in both arenas to fabricate evidence as a way of convicting people she wants to see put behind bars. However, it later turns out (as future stories will show) that his main problem isn't what Helena can do with her power, but the fact that he can't wrap his mind around a woman actively putting her own life in danger in pursuit of justice. Despite some wonderful character studies of both Helena and Harry in this chapter, the character that regrettably gets the short end of the stick on this front is Carole Martin, Helena's secretary. Carole has always been a fascinating character to me because she was one of the few prominent black women in a DC Comic who wasn't a superhero. She was actually an 'every woman' who happened to be an important person in a superhero's life. She didn't just exist in the background since she actually had a voice and even had her own story arc that could've been further fleshed out. Within this particular story, we learn that Carole was formerly married and presumably has a son. We also learn that she did something in the past that could legally compromise her, and that 'something' facilitated her ex-husband being able to blackmail her. The problem, however, arises with the writer not going into details on what that 'something' is, and leaves it to the imagination of the reader to fill in those blanks. Not only does it make for a less compelling story, but as a reader, it leaves a lot to be desired. The fact that Levitz never revisited this storyline to provide the reader some closure on Carole's dilemma doesn't help on that front. The other problem with not going into details about Carole's past is that it takes focus away from her character and ultimately makes her story about Helena. Ultimately, Carole's problem with her ex-husband becomes a problem that the Huntress resolves, effectively making her the hero of Carole's story. Ultimately, Carole is prescribed the role of the victim while Helena is given the role of her saviour. The fact that the conflict with Carole is also used to establish Helena Wayne as a feminist heroine further supports that point. This wouldn't be so much a problem if black women had more diverse representation in 1981 and if the hero-victim dynamic wasn't accompanied by accidental racism. Whereas white women were given the luxury of more diverse representation by the 1980s, the same wasn't true for black women as there were fewer of them in existence during that time. The only prominent black female DC superhero at the time was Vixen and she was existing only within the continuity of Earth-1. On Earth-2, nearly 100% of this world's heroines were white women and women of colour didn't start appearing as superheroes until the establishment of Infinity Inc in 1984, which led to the creation of Beth Chapel and Yolanda Montez. Given that reality, while it was Levitz' intention to present this story as feminist, the lack of diverse representation for black women at the time unfortunately led to reinforcing a racial inequality instead, especially since Helena--as a white woman--was already overrepresented on Earth-2. 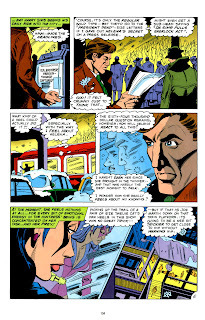 Another example of a racial inequality that was reinforced in these pages was the representation of Joe Martin himself. While representation of black men in 1981 was (marginally) a bit more diverse than it was for black women, the popular narrative for black men at the time was still that of a criminal, thug, and drug dealer. Joe unfortunately does play up to that stereotype in both the way he is dressed and the way that he carries himself. While not established as a drug dealer, he is still presented as a thug who is also an abuser of women. 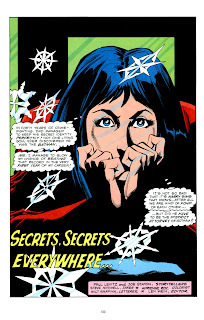 Though not a perfect story (especially on the front of racial representation), Secrets, Secrets Everywhere as a whole is still a good story on the front of character development, at least for Helena Wayne and Harry Sims to a lesser extent. This is one of the few stories from the pre-Crisis era that doesn't primarily focus on Helena Wayne's mission statement as the Huntress, and instead focuses on her personal life. This is one of the few stories that has her examine the pros and cons of the superhero gig, and whether or not it's worth sacrificing her personal life to maintain. I think the fact that Levitz has the character introspect on the realities that the superhero lifestyle entails adds depth to her character, especially when she realises how important it is for her to have a personal life as well.